FIFA World Cup 2018 Now Final Stage Coming Soon. Who's Win Semifinal and Reach 2018 FIFA World Cup Russia Final. semi final world cup 2018 France V/s Belgium On 10th July and Croatia V/s England On 11th July Predict Who's Win and play Final of 2018 Russia FIFA World Cup. MaalFreeKaa.in No.1 Online Giveaway Website you can find all update about Online Contest, Free Stuff Deal, Free Sample, Cashback, Loot Deal Coupon and Freebie Deal. Now We Are High Ranked Web in Publish Insurance Car Insurance Article for reward. Football remains a highly unpredictable sport! With 32 teams taking part, it can be difficult to predict the winner, now only 8 teams left! Here, you can predict which two teams through to the final! Step 2: Share this post on your social media page! Share your link with us! 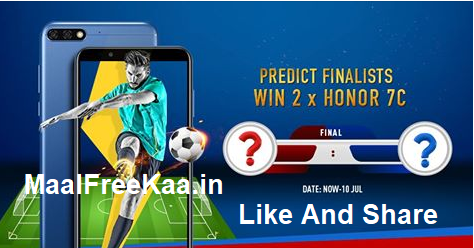 Predict correctly (both teams) and get a chance to win Honor 7C! Predict correctly (one team) and get a chance to win Honor Earphone! Other 5 winners will be randomly selected by percentages (see attached file) of total comments of that category and the file unlock code will be announced on 14 Jul. 1. Entries must be original and your own work. Entries cannot contain any infringing, threatening, false, misleading, abusive, defamatory, vulgar, obscene, scandalous, inflammatory, pornographic or profane content. The ID will be banned once we found. 2. Only Indian fans are eligible to participate in this contest. 3. Please give your delivery information within 5 days after receiving our message or you will be unqualified for the prize.